Life Before the Dinosaurs: Sidneyia. 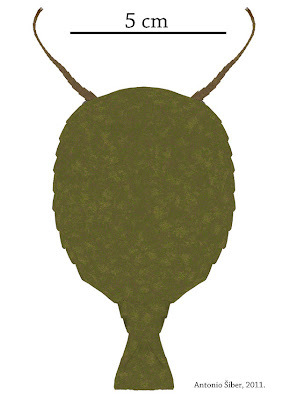 Sidneyia is a Cambrian arthropod that was found in the Burgess Shale by Walcott. He found it in 1910 on his first day at the Burgess Shale. Its name, Sidneyia inexpectans, means "Sidney's discovery." Walcott's son Sidney helped him discover it. Walcott named many other animals after members of his family. Sidneyia was about two to five inches long and was probably a bottom-dwelling carnivore that crawled across the sea floor in search of prey. It probably fed on animals like hyoliths and trilobites. Sidneyia's wide, flat telson probably could have propelled it across the sea floor for a burst of speed, but that is just my hypothesis.